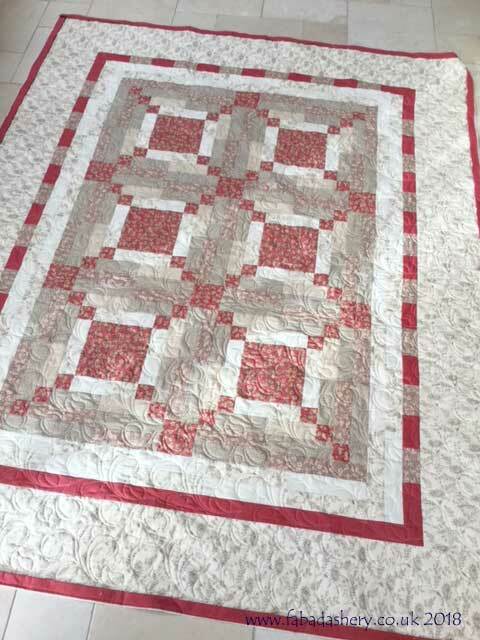 This baby quilt has been made by Valerie for a new member of the family. 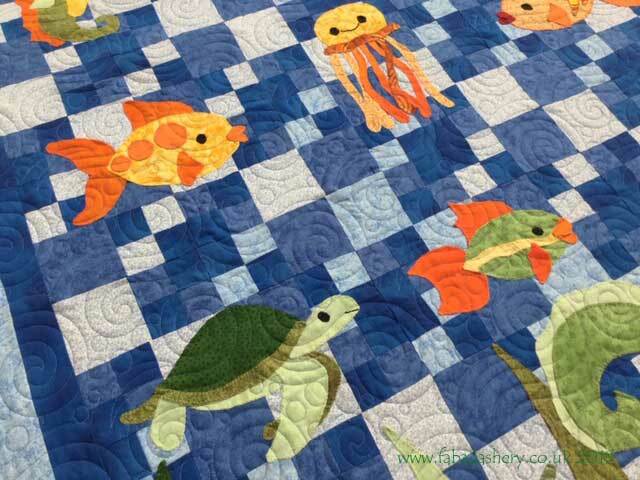 It is a pattern featured in the book 'Animal Parade - Adorable Applique Quilt Patterns' by Cheri Leffler. Both Valerie and I were working to a tight deadline, but we managed it. It will eventually head out to Australia where they will meet the new baby for the first time. 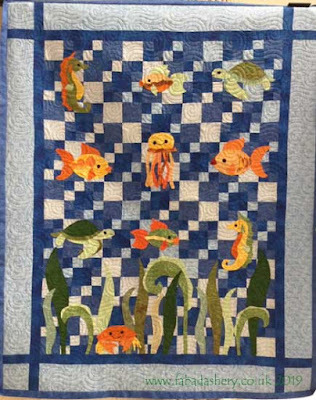 All the sea creatures are hand appliqued onto a pieced background and the bright orange against the blues really makes the quilt pop. When choosing the quilt pattern, Valerie chose this perfect quilting pattern called 'Seafoam' designed by Patricia Ritter, which has swirls and bubbles to match the underwater theme. It looks great on the finished article. I am sure that it will get plenty of use. Marlene only recently took up quilting as a pastime, but now she has the bug, she is prolific. Her current love is French General fabric with its elegant soft reds and greys. 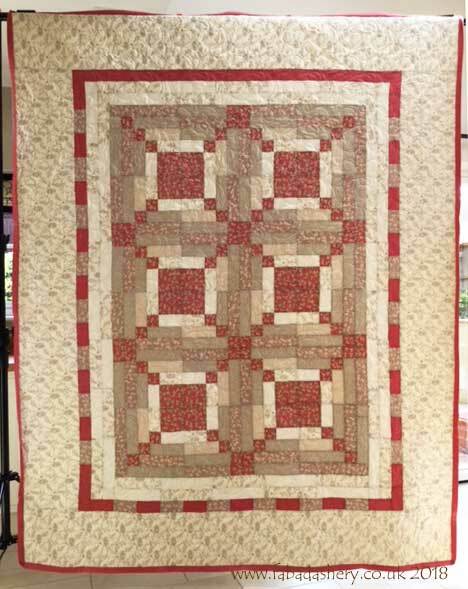 This quilt was made by hand and was was designed by Marlene herself. In this photo you can see that the binding is already on the quilt. 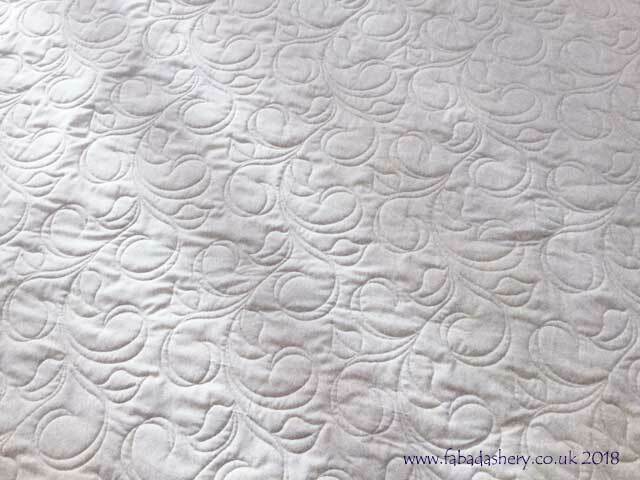 As part of Fabadashery Longarm Quilting, I offer a quilt binding service. You can provide the fabric / or cut binding and I will machine apply it to the quilt and trim it down so that you can finish the reverse of the quilting by hand, which is the bit Marlene enjoys doing. 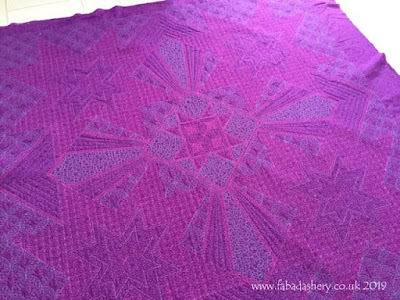 With elegant colours, Marlene chose an elegant quilting pattern from the Fabadashery Longarm Quiling library called 'Leaves and Ribbons', which shows up nicely on the neutral backing fabric. 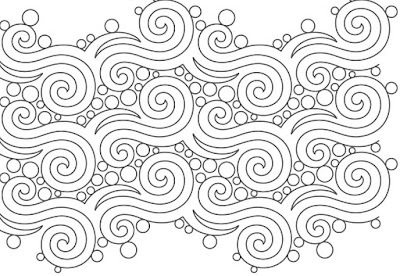 The left over fabric from this project is in line for the next quilt. 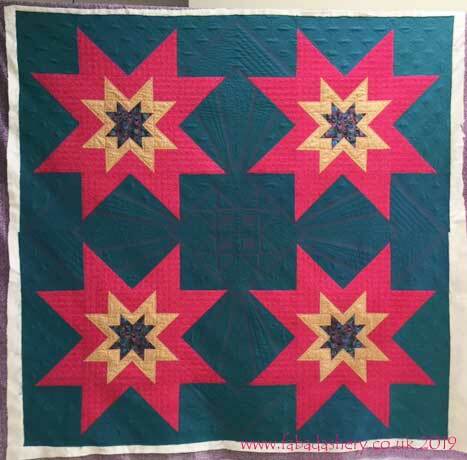 Detail - Verna's Eight-Pointed Star quilt in Oakshott Fabrics. 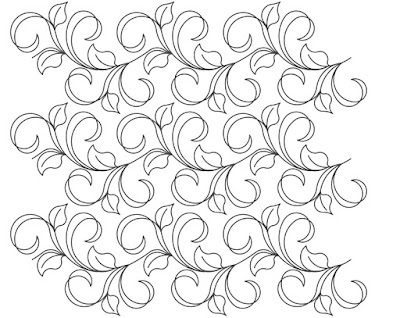 Being a longarm quilter for a profession always offers creative challenges. 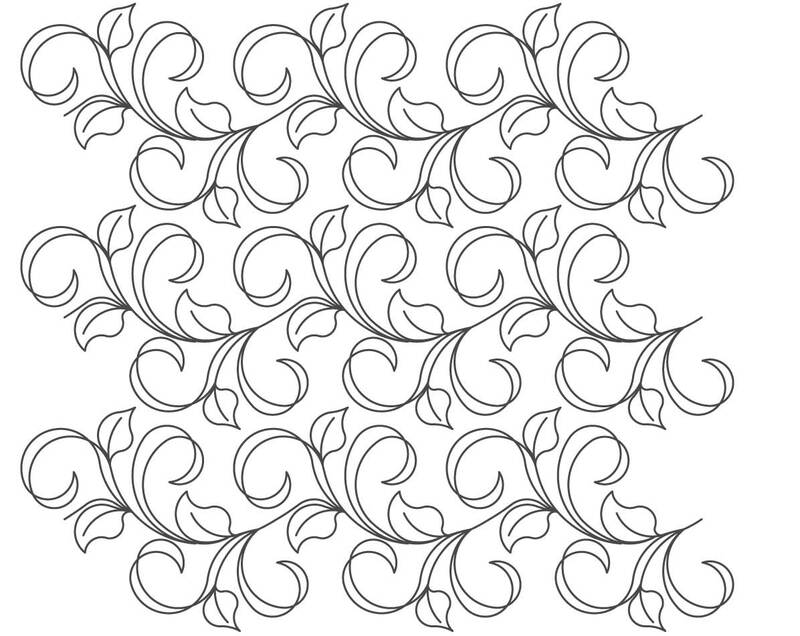 When a quilt walks through the door for custom quilting and there is a lot of blank space it offers a lot of design opportunities and a chance to push myself. Verna brought this striking quilt to me made out of Oakshott fabrics and before I could put it on the frame I had to work out a plan for what I needed to do. 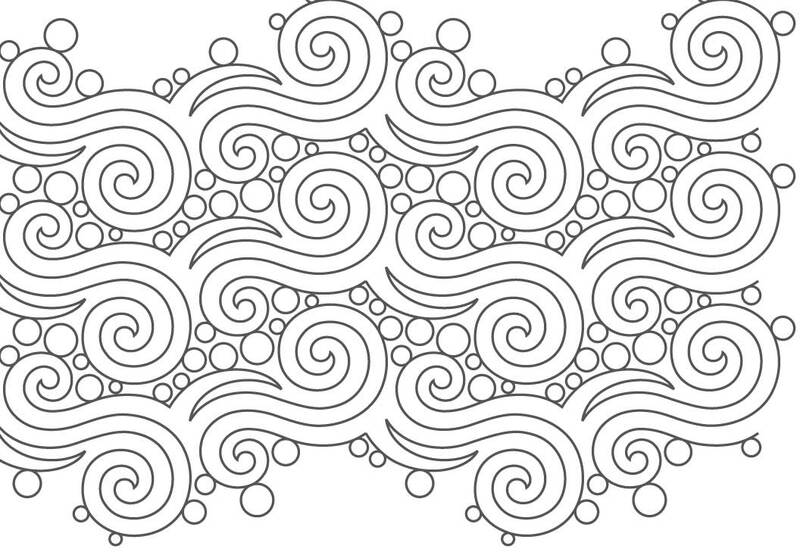 Sometimes this takes longer that the actual quilting, but the planning is always worth the effort. 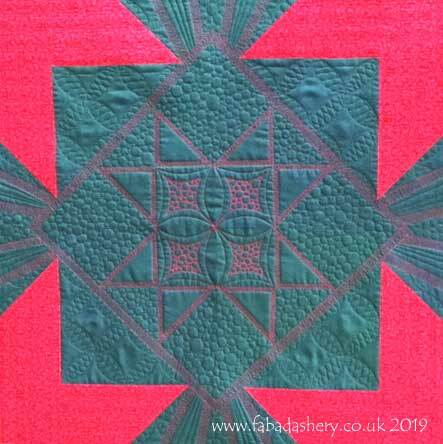 Above is a detailed picture of the centre of the quilt where I have replicated the eight-pointed star block in dense quilting. I used this design technique to draw the eye into a focal point and it was the centre piece to a four pointed star that I designed for the quilting, to sit behind the main piecing that Verna had done. 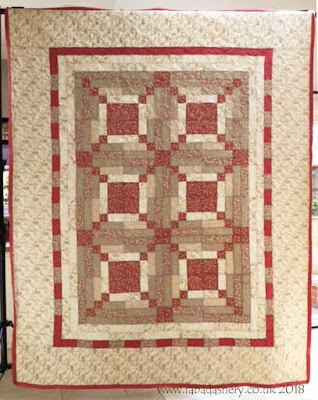 The photo does not show off the special quality of the Oakshott fabrics, but with the texture of the quilting, it really brought it alive. 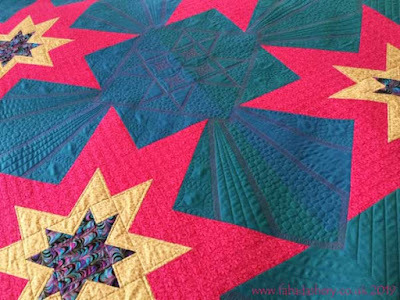 Verna's Eight-Pointed Star quilt in Oakshott Fabrics. And below is a picture of the back of the quilt where you can probably see more of the quilting that was done and shows the overall quilting design which I added to the quilt. 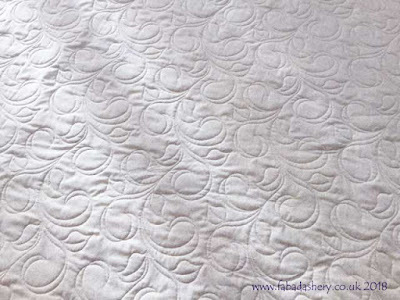 You can see the colour thread changes and the structure that quilting can add to a quilt. I think this quilt maybe heading to a new home, but for now I think Verna is hanging on to it. Back - Verna's Eight-Pointed Star quilt in Oakshott Fabrics.